UPDATED — WASHINGTON (CNS) — Pope Francis has named Auxiliary Bishop Oscar A. Solis of Los Angeles as bishop of Salt Lake City. 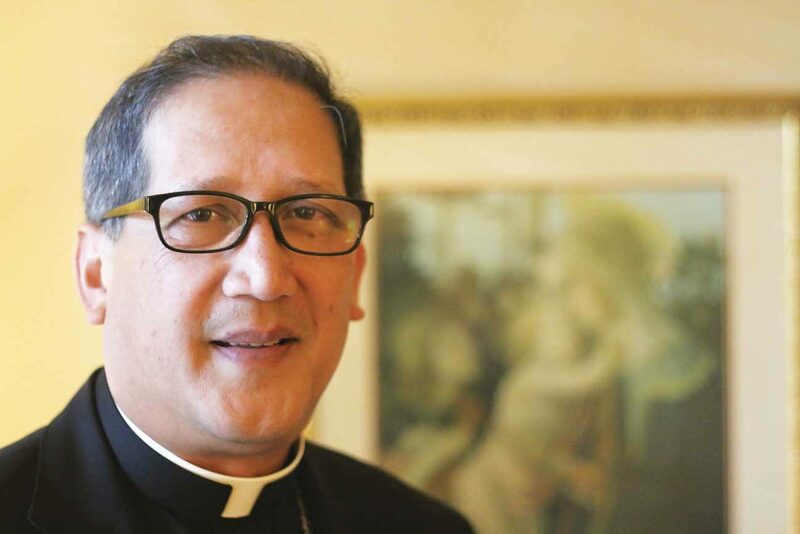 Bishop Solis, 63, a native of San Jose City, Nueva Ecija, Philippines, has been auxiliary bishop of Los Angeles since 2004. Previously, he served the Archdiocese of Manila and the Diocese of Cabanatuan, both in the Philippines, before coming to the United States in 1984. The appointment was announced Jan. 10 in Washington by Archbishop Christophe Pierre, apostolic nuncio to the United States. At a news conference at diocesan offices where he was introduced, Bishop Solis said the visit was only his second in Utah, but he pledged to quickly learn about the Catholic community of 300,000 people. “I humbly submit myself to you as the new servant leader of the Diocese of Salt Lake City and a shepherd for the people of the state of Utah,” he said. The call from Archbishop Pierre was “a curveball out of nowhere,” Bishop Solis said, recalling how he asked, “Am I in trouble?” But the nuncio “made me feel at peace” with the assignment, the bishop said. After the call, the bishop said his life changed completely, and he felt that the “world stopped turning around.” He felt afraid of the uncertainties and that the human element somehow overcame the grace of God. Since receiving the appointment, he has learned about Catholic Community Services’ and other pastoral outreach to the poor and needy. He said he looked forward to hearing the voices of the well-known Madeleine Choir School students and work with The Church of Jesus Christ of Latter-day Saints to enhance the well-being of all the people of Utah. Bishop Solis’ installation is March 7 at the Cathedral of the Madeleine in Salt Lake City. The Diocese of Salt Lake City has been without a bishop since Archbishop John C. Wester was installed in the Archdiocese of Santa Fe June 4, 2015. He added that there’s always a reason when God puts you in a new place. Los Angeles Archbishop Jose H. Gomez said Bishop Solis will be missed by the archdiocese. After arriving in the U.S., Bishop Solis served as associate pastor of St. Rocco Church in Union City, New Jersey, from 1984 to 1988 and was incardinated in the Diocese of Houma-Thibodaux, Louisiana, in 1988 and served as a parish priest for 15 years prior to his appointment to Los Angeles. In Los Angeles, Bishop Solis served in a variety of roles, including as vicar for Ethnic Ministry from his ordination in 2004 until 2009. He also served as the director of the Office of Justice and Peace from 2005 to 2009. Then he was assigned to the San Pedro Pastoral Region, covering southern Los Angeles County, where he serves today. Contributing to this report were Marie Mischel, editor of the Intermountain Catholic, newspaper of the Salt Lake City Diocese, and J.D. Long-Garcia is editor-in-chief of Angelus News, the multimedia platform of the Archdiocese of Los Angeles.